The Interest Rate Chart – since 1915; the longest interest rate chart available – over 100 years! Full-color for high visibility and readability. Recessionary periods – geopolitical events – presidential terms – Federal Reserve chairman are highlighted. You can also Customize the Historical Interest Rate Chart with your Organization’s Logo or Message! You’ll find SRC’s Historical Interest Rate Chart Poster an indispensable tool for meetings, conferences, group discussions, or for your own personal use, making it easy to identify data and to spot trends and critical turning points. 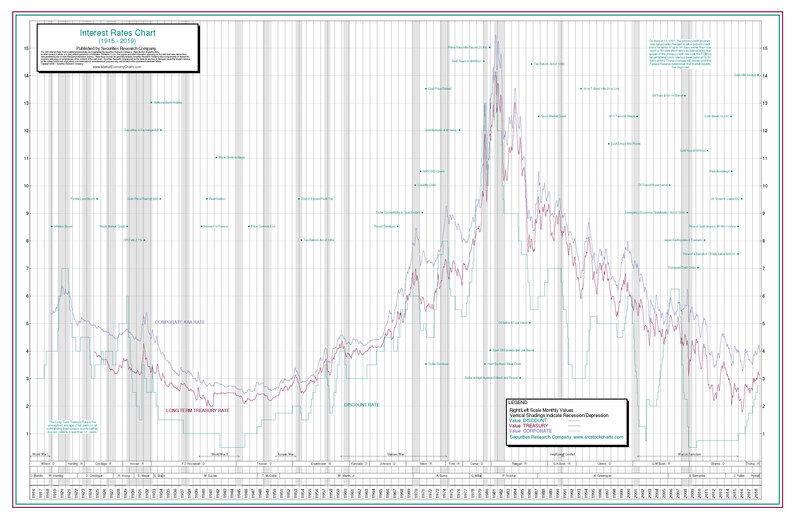 Order your SRC Historical Interest Rates Chart Poster today. Bulk quantity discounts are available, and add your company’s message or logo for $49. I purchase a lot of items online and this was by far the best experience I have ever had with any company, ever. The product looks exceptional, our company logo looks awesome, and your service and response was fast and extremely efficient. We will be purchasing a Stock Market Chart Poster from your company every year for years to come. Justin Krznarich – Thunderbird Wealth Mgmt. 11" x 17", 24" x 36"